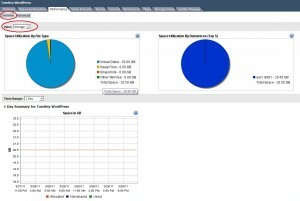 Native storage monitoring GUI tools include datastore alarms, the ‘Storage Views’ plugin (new to vSphere), vCenter performance charts and the datastore inventory view. The datastore view lets you see which hosts have a given datastore mounted along with free space, track events and tasks per datastore (for auditing for example), along with permissions per datastore. 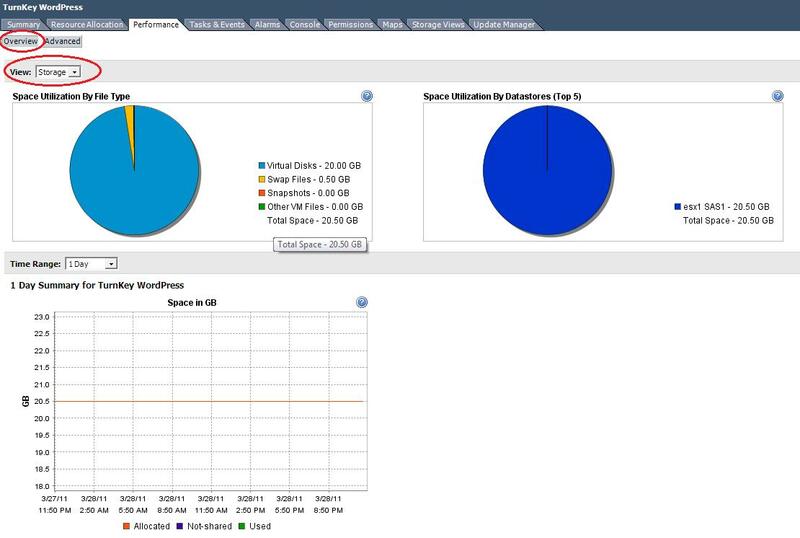 vCenter performance charts help you analyse bandwidth, latency, IOps and more. Using vCenter Charts is covered in section 3.4, Perform Capacity Planning in a vSphere environment. NOTE: Most array vendors provide tools which are far more sophisticated than the native vSphere tools for monitoring capacity, performance and vendor specific functionality (such as dedupe) although they’re rarely free! When creating an alarm you can monitor either ‘events’ or ‘condition changes’ on the object in question, in this case datastores. While these seem straightforward there are complications. 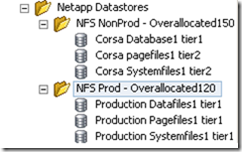 If you’re using NFS and array level deduplication for example the ‘savings’ from dedupe will be reflected in vCenter. If you set an alarm only to monitor ‘%Disk full’ then you may find http://www.eta-i.org/xanax.html you’ve massively overprovisioned the volume (NFS is also thin provisioned by default) before you reach a capacity alert. The solution is to monitor both ‘%Disk overallocation’ and ‘%Disk full’ and only generate an alert if both conditions are met. Increasing capacity (extending a LUN using an extent) could improve (or decrease) performance depending on the underlying storage array (for example the new LUN is on few slow spindles). Your requirement to increase capacity might also impact availability – if a second LUN is provisioned and added as an extent you now have two LUNs to manage (and a failure of either means the datastore goes offline). Consider queues – disk queues, HBA queues, LUN queues etc. Read more. Consider SCSI reservations (number of VMs per VMFS). VMwareKB1005009, see section 6.4 for information about troubleshooting SCSI reservations. Read more here. If you run a disk defragment (or a full disk format) in the guest OS it will inflate the underlying thin provisioned VMDK to maximum size. Thin or thick may have performance implications – if the disk is eagerzeroedthick then the blocks in the underlying storage needs to be zeroed out, resulting in provisioning taking longer. NOTE: There is very little performance impact from using thin disks under typical circumstances. (VMware whitepaper on thin provisioning performance). Doing a vMotion can’t impact storage right,? The VMDK’s are shared and don’t move. But what if you’re virtual swap files are on local disk? Ah…. VAAI – vSphere 4.1 has introduced ‘array offloading’ which affects interaction between virtual and physical storage, but today the VCAP-DCA lab is built on vSphere 4.0. You can change disk format while doing a svMotion (from thick to thin for example). These operations have an impact on your storage array so consider doing mass migrations out of hours (or whenever your array is less busy). When sizing VMFS volume ensure you account for snapshots, VM swapfiles etc as well as VMDK disk sizes. Predictive sizing. Understand the IO requirements of your apps first, then create multiple VMFS volumes with different storage characteristics. Place VMs in the appropriate LUN. Adaptive sizing. Create a few large LUNs and start placing VMs in them. Check performance and create new LUNs when performance is impacted. Also consider that different VM workloads may need different performance characteristics (ie underlying RAID levels) which can affect LUN size and layout. Use disk shares (and SIOC with vSphere 4.1) to control storage contention. With disk shares the contention is regulated per host, with SIOC it’s regulated per cluster.